Aeryn's Creative Explosion: Studio Monday: Project "Purge Pile"
Studio Monday: Project "Purge Pile"
This is my purge pile (except the one labelled "patterned paper"). It has sat around for months, or even years now. I separated my paper to see if I was well and truly done with what was in there, and all I did was ignore it, so obviously I was bored with the paper. But I don't have anyone to purge to, so this paper would just have to go in the trash if I can't figure out something to do with it. 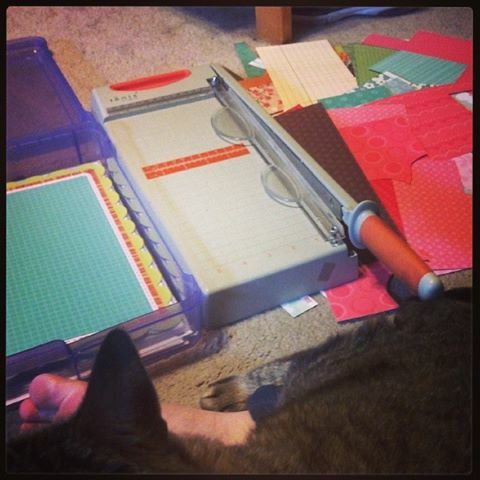 Then I came up with the idea to cut everything down to 6x6 and then maybe I will use it on cards. My 6x6 paper is stored in a separate bin from my 12x12 paper, so that'd help too by not adding all of this crap back into the regular rotation. Since I needed a big place to do this I plopped myself down in front of the TV in the living room, got my trimmer, and got to work. This picture was taken at 11am. At 12pm I had this. One purge box emptied and cut down to 6x6. The scraps too small to do that were just tossed to the side and made a SUPER mess. By 14:00 I had decided that instead of having that huge mess, I should try and cut down the paper even smaller, into 3x4 cards, to get maximum use out of the scraps. By 15:30 I was finished with that and had two boxes emptied, a big stack of 6x6, and a decent stack of 3x4 as well. I had also found some lines that might be able to be given new life in the 6x6 format as a set instead of organised by colour, those are separated out in the purple bin's lid. 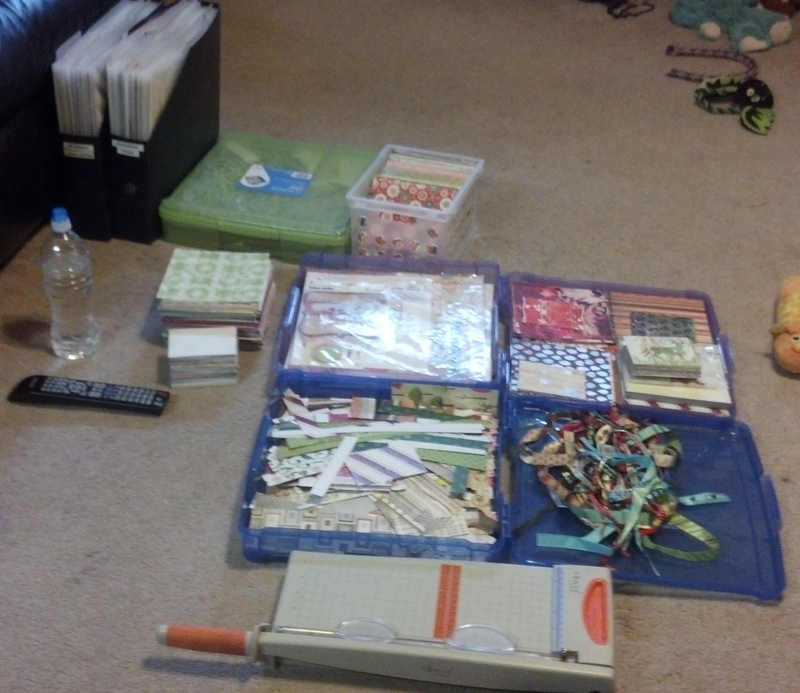 The main part of that bin is used for sticker sheets, shaped paper, and two kits that I found. I had won them at an Expo and never really liked them enough to bother opening them. This photo was taken at 17:00. At 23:00 I was ready to move on to the paper in my Cropper Hoppers from my paper cart. I had taken a break to eat dinner and watch a movie with Mike. The break had really been needed as all this sitting on the floor was really taking a toll on me physically. My back was killing me and I basically spent the entire day popping pain killers. They didn't work in the slightest, but I wanted to just get this job done so I wouldn't have to think about it any more. It was somewhere around my third movie, about 12am, that I decided though it would slow me down I would have to continue my cutting on my tummy. My back just could not take the sitting any more. My cutting was slower, but a lot less painful after that. 02:00 and I finally finished, just as the movie I was watching ended. 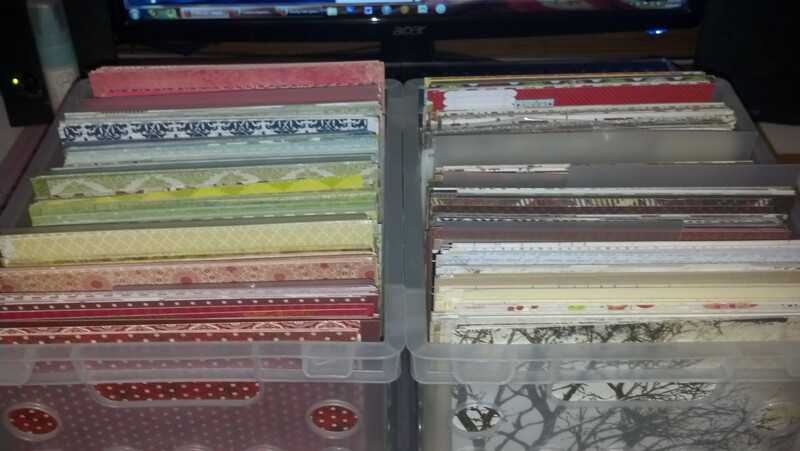 You can see how huge the stack of 6x6 papers got, and I knew I'd need that second bin to hold them. 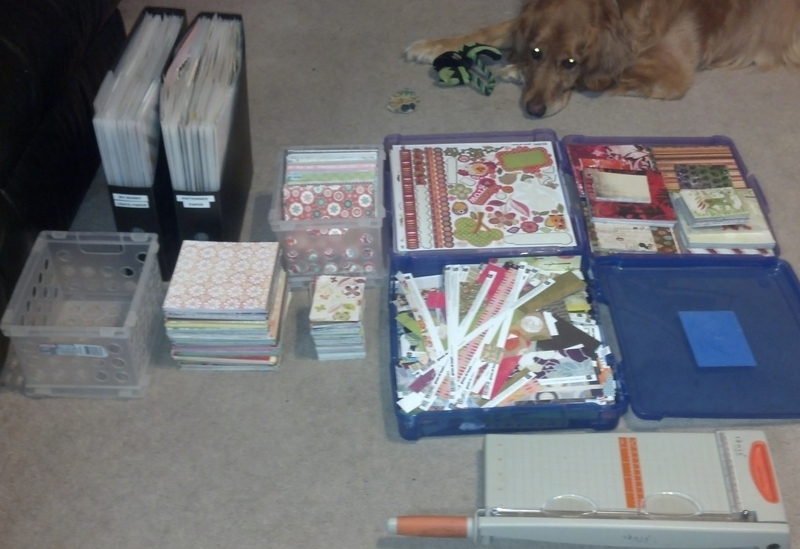 You can also see the little themed piles I separated out. 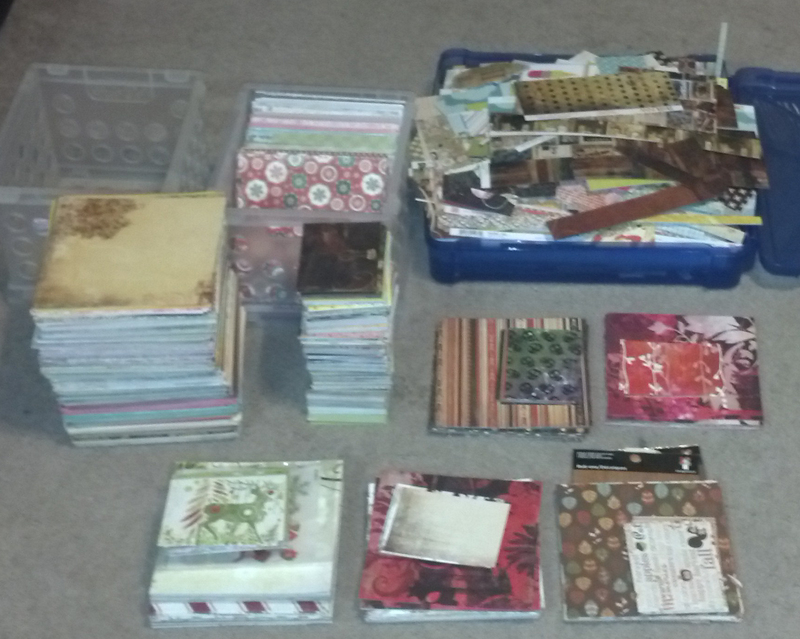 Halloween, Fall, and Christmas, to see if I could give them new life as exclusively paper for cards. They just wouldn't look right mixed in with everything and I didn't want to give up on all of them yet since the two on the right are some of my favourites from years past. In the end the scraps and cutoffs filled that entire Iris container. That part is going in the trash. 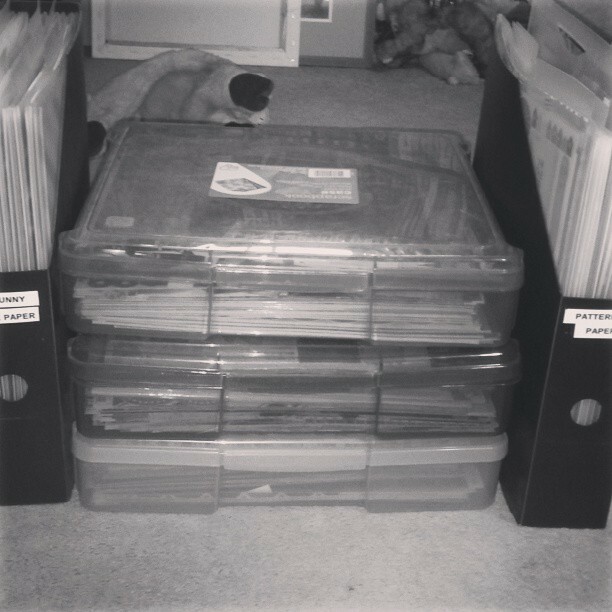 Here was my project for today: to take that huge stack of 6x6 and sort it into the bins by colour. At least this job could be done on my desk and actually went pretty quickly. I'm surprised the whole rainbow fit into one container like that, and there is a TON of pink because while I end up with it sometimes, I just don't enjoy using it. We'll see if I can change that, at least on cards. As far as the paper that I scrapbook layouts with, I'm down to 17 lines, including the ones that I just got from my recent 2Peas order (picture below). I don't like having too much paper on hand, so this is good. I don't count the 6x6 papers as part of my stash since they're only for cards and most all of it is rejected paper anyway. If I can use it, fine, if I can't it's going out one way or another. But right now the 12x12 stuff is new and decently exciting, so I'm going to do my best to use it up completely so it doesn't have to live in these bins here.